Earth-friendly no longer equals Space Age design. Welcome to EcoManor, built in Atlanta by Ted Turner's daughter. Fortune's Patricia Sellers takes the tour. 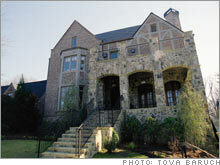 (Fortune Magazine) -- From the outside, the Seydel family's new home looks like any old Tudor manse. Well, it's too tall for its quiet block. (Neighbors have complained.) But who would guess that this is the largest eco-friendly house in America? With its 27 photovoltaic panels on the roof, solar tubes that snake into interior rooms, geothermal heat pumps, and rainwater-collecting cisterns, this is, in fact, the first home over 5,000 square feet ever to be certified by the U.S. Green Building Council - and evidence of a new wave of eco-building that doesn't look like eco-building. "Everybody has in their head a picture of an environmental home - usually some Space Age design," says homeowner Laura Turner Seydel, who moves into EcoManor in March. "We wanted to prove that it doesn't have to look odd." EcoManor won LEED certification using innovations like geothermal systems, photovoltaic panels and soy-based insulation. 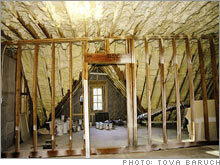 In the attic, cellulose insulation costs more - but is super efficient. The Seydels at home: (from left) Vasser, John R., Laura Elizabeth and parents, Laura and Rutherford. Not everyone has the means (or the desire) to build an environmentally sound house from the ground up. But here are five ways to make your own manor more like EcoManor. Make sure your water heater and plumbing systems are insulated. Or consider a "tankless" model, which can slice your bills dramatically. The Seydels went all out with underground electric pumps, which use the ground temperature to help heat or cool the house. Residential systems average $7,500 and reduce energy costs 30 to 60 percent. For floors, forgo traditional hardwood in favor of rapidly renewable alternatives like bamboo or cork. The Seydels also used Lyptus, from eucalyptus trees, for their cabinets. Recycle your runoff: The average home sends more than 100,000 liters of usable water down the drain each year. Thanks to a local company called RainHarvest, the Seydels reuse rainwater and water from sinks and showers to flush toilets and irrigate their yard. Find out what it takes to create a green home! Fortune Magazine profiles a couple who built their dream home from the ground up. Seydel is also the daughter of Ted Turner - which gives you a clue to where her environmental drive comes from. While her billionaire daddy has practiced what he has preached by buying two million acres to preserve (he is America's largest individual landowner), Seydel thinks big on one tiny tract: a half-acre in Atlanta's highbrow Buckhead neighborhood. She and her husband, Rutherford, an environmental lawyer, spent $1.5 million to construct EcoManor - some 10 percent extra for going green, estimates architect Bill Harrison. But he predicts that the Seydels' energy costs will be 80 to 90 percent below average for a like-sized Atlanta home. EcoManor was born four years ago when Laura - who serves on more than a dozen nonprofit environmental boards - and Rutherford bought a shabby two-bedroom cottage behind their sprawling hilltop home. They had planned to turn it into a guesthouse. But a few weeks after their purchase, a magnificent 200-year-old oak, whipped by a storm, fell and crushed the tiny house. Ted Turner is the one who, after touring the devastation with Rutherford, prodded the Seydels to tear it down and rebuild. "And when they started from scratch, they decided to go eco-friendly," Ted recalls. Or more like eco-obsessive. Self-proclaimed environmental activists, the Seydels collect rainwater to fill their toilets - low-flush, dual-flow units from Japanese manufacturer Toto. ("Press button No. 1 when you go No. 1, and No. 2 when you go No. 2," instructs Laura, 45, as we tour the master bathroom, which is naturally lit via four solar tubes.) Meanwhile, used "gray" water from the Seydels' sinks and showers passes through filters and irrigates the lawn - which is drought-tolerant, of course. Throughout the five-bedroom house (the Seydels have three children, 9, 11 and 14), the doors are wheat-core - yes, composed of wheat, and formaldehyde-free. In the first-floor study the wallpaper is recycled newspaper, though you'd never know it: It's an elegant-looking linen white. The floors downstairs are made of fallen oak from Ted Turner's plantation, Avalon, in Florida. (Upstairs the floors are sustainable wood from Home Depot (Charts), and they don't look as nice.) In the attic the insulation is made of cellulose and soy-based foam. "It's the most expensive but also the most efficient," says Rutherford, 43, as we explore EcoManor's 6,000-plus square feet. While Laura thinks of EcoManor as the ultimate nontoxic environment (she evangelizes about hemp pillows, jute draperies, and natural cleaning products), Rutherford views their new home as a sort of energy toy. His favorite gizmo, in the kitchen, is a 15-inch monitor that measures and controls the family's energy costs per second - "down to a hundredth of a cent," Rutherford boasts. "If the kids have a party in the basement, I can tell how much the party cost." Predicts architect Harrison: "Five or ten years from now we'll be building homes that are totally self-sufficient in terms of energy usage." Most LEED-certified homes are in the West and Northeast; EcoManor is the first in the Southeast. The movement is spreading to mass-market home development: Between 5 and 10 percent of new homes will probably be eco-friendly by 2010, according to the National Association of Home Builders. Meanwhile, Rutherford wants to entice everyone, especially the luxury set, to go for LEED status. Currently LEED judges favor small homes in their rating system, which effectively penalizes rich folks who like to live large. "That shouldn't be the case. People who can afford to build stately homes tend to adopt revolutionary technologies early. These are the people who can make a huge impact," says Rutherford, who is lobbying the Green Building Council to ease the restrictions. The council is considering it. Lately Turner has started using recyclable materials and nontoxic paints - and also has invested millions in a solar-energy startup. Says Laura: "We guilt-tripped him into it."